AUGUSTA, Maine — Republican Sen. Susan Collins made national headlines Monday when she declared Donald Trump, her party’s candidate, unfit for the presidency. 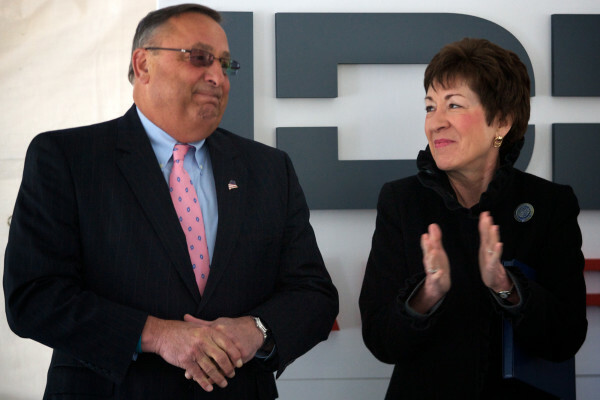 Her rejection of Trump constitutes another major point of division between Maine’s most prominent Republican elected officials — Collins and Gov. Paul LePage, an early endorser of Trump — and spurred questions Tuesday about whether Trump’s campaign has opened new rifts among Republicans nationally and in Maine. High-level endorsements by elected officials usually occur in an atmosphere of partisan unity — at least relative to today’s Republican and Democratic parties, which are as internally divided as they have been in recent history. But both parties have had to devote much energy this year to salving wounds caused by nasty nominating processes that resulted in historically unpopular presidential candidates. There also is a divide between how voters view state and local elections compared to national politics, but will a presidential election between two unpopular major-party candidates change that in Maine? After a confrontational legislative session that drove a wedge between LePage and Republican Senate leaders while drawing comparisons to congressional gridlock, will more Maine political norms be shredded during this year’s divisive, unorthodox campaign? Collins’ non-endorsement took some guts. She became one of a handful of sitting Republican U.S. senators to denounce Trump — a move that came exactly three months before Election Day. Collins is known for her careful, strategic decisions about what she publicly supports — and for often making them after political pressure passes and her position no longer matters. A year ago, for example, Collins faced enormous pressure regarding President Barack Obama’s administration’s Iran nuclear deal. Collins’ vote was seen as crucial in head-counting around whether a bill to scuttle the deal could survive a veto, but she didn’t reveal her position until the eve of the debate — and after it was clear there was enough support for the bill for it to be safe. In that instance, she sided with her party, but in a way that did not change the outcome of the process. Now, she is taking a stance against her party’s presidential nominee. Because Collins has gained a carefully maintained reputation as one of the Senate’s rare moderate members, national reporters have hounded her for statements on Trump, especially after he has made controversial comments that reflect anything but moderation. Those questions intensified after it became apparent that Trump would win the party’s nomination. Until Monday, Collins demurred when asked whether she would vote for Trump. With her op-ed in the Washington Post, she took the initiative to offer a detailed rationale for her position rather than in response to media inquiries. By doing so, she appeared to hammer her stake in the ground — though Democrats continue to brand her as trying to have it both ways. Collins reiterated Tuesday that she does not plan to vote for Clinton. It wasn’t without risk. If Trump wins the presidency, he won’t likely forget who was against, nor will his supporters. His campaign is based on tapping a “throw the bums out” anger among voters infuriated by the federal government. By speaking out against Trump, Collins sided with the establishment against the populist revolution fueling Trump’s campaign. That could affect Collins in matters such as committee assignments and in Republican leadership’s willingness to support her bills. Collins has built her reputation on constituent service and alliance-building, so her public stance against the Republican nominee could make that more difficult by triggering hard feelings among GOP colleagues whose support she will need. Collins also risks alienating some of the more conservative members of her party for speaking out against Trump, but that doesn’t matter much. With a sky-high 73 percent approval rating after a 40-point re-election win in 2014, she has support to burn and the Republicans angry at her now are probably those who already call her a Republican in Name Only for her moderate views. Will support for Trump be a litmus test for Republican candidates? Linking political opponents to “supporting the failed policies of” their leaders is nothing new in campaigns that try to spread the blame for unpopular events. Democrats tried to do it in LePage’s 2012 re-election bid, and Republicans are have done it against Obama. It’s a well-worn but questionable strategy. Case in point: Obama and LePage easily won re-election. Feeling the most heat after Collins’ announcement is undoubtedly Republican 2nd District U.S. Rep. Bruce Poliquin, who is alone among Maine’s congressional delegation in that he has refused to endorse a presidential candidate despite being badgered by Democrats, including re-election opponent Emily Cain, to do so. Since the beginning of the nomination campaign, Poliquin has aggressively avoided discussion of presidential candidates, and as recently as Tuesday he maintained that discipline, redirecting questions after a Bangor Rotary session to jobs, trade and other focal points of his re-election campaign. Talking about Trump is less of an imperative in legislative elections. Republican Sen. Roger Katz of Augusta publicly denounced Trump this week, but it was more because of personal choice than the result of pressure. Endorsements probably don’t matter much for legislative candidates. B.J. McCollister, director of the Maine Senate Democratic Campaign Committee, said most voters are focused on issues closer to home. Jason Savage, executive director of the Maine Republican Party, agreed on that point. “The presidential race, while it’s still important, becomes a background issue,” he said, though he acknowledged that Trump’s from-outside-the-establishment candidacy is challenging norms on many fronts. Though LePage initially favored New Jersey Gov. Chris Christie for the presidency, he has become among the highest-ranking elected officials to offer a full-throated endorsement of Trump. He has gone as far as framing himself and Trump as brothers in bombast who have pushed political correctness down the list of priorities. It is unlikely that the disagreement over the party’s top two leaders will boil into the public, but there’s no question that it only deepens a wedge in the Maine Republican Party that has been on full display from having delegates rejected from the 2012 Republican National Convention to major legislative policy splits between Maine House and Senate Republicans. Collins’ move was calculated and safe. There have been comparisons between Collins’ Trump announcement and former Maine Sen. Margaret Chase Smith’s famous 1950 “Declaration of Conscience” against Joseph McCarthy and his damning accusations of communism. Those comparisons don’t bear up under scrutiny. The stakes for Collins are low compared to what Smith faced. Collins has gained some national attention for denouncing Trump, but it matters little in Maine or to her future in elected office. Politically, it’s probably a wash.